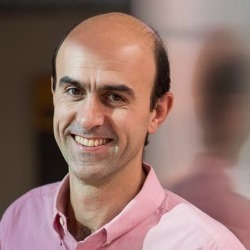 Mehrdad Jazayeri joined the MIT faculty in January 2013 as an assistant professor in the Department of Brain and Cognitive Sciences and an Investigator in the McGovern Institute. Jazayeri, who is originally from Iran, obtained a B.Sc in Electrical Engineering from Sharif University of Technology in Tehran. He received his PhD from New York University, where he studied with J. Anthony Movshon, winning the 2007 Dean’s award for the most outstanding dissertation in the university. After graduating, he was awarded a Helen Hay Whitney fellowship to join the laboratory of Michael Shadlen at the University of Washington, where he was a postdoctoral researcher. This course provides students with the theoretical background and practical skills needed to analyze and model neurobiological observations at the molecular, systems and cognitive levels. Students will develop an intuitive understanding of mathematical tools and computational techniques, and learn to apply this knowledge to analyze, visualize and model research data using MATLAB programming. Topics include: Linear Systems and Operations, Dimensionality Reduction (e.g. PCA), Bayesian Approaches, Descriptive and Generative Models, Classification and Clustering, and Dynamical Systems. Jazayeri, M., Lindbloom-Brown, Z. and Horwitz, G.D. (2012). Saccadic eye movements evoked by optogenetic activation of primate V1. Nat Neurosci. 15(10):1368-70. Jazayeri, M., Wallisch, P., & Movshon, J.A. (2012). Dynamics of MT cell responses to grating triplets. J. Neurosci. 32(24):8242-53. Graf, A., Kohn, A., Jazayeri, M. and Movshon A.J. (2011). Decoding the activity of neuronal populations in macaque primary visual cortex. Nat Neurosci. 14(2):239-245. Jazayeri, M. and Shadlen, M.N. Temporal context calibrates interval timing. (2010). Nat Neurosci. 13, 1020-6.